I have finally come to a conclusion for this snowstorm. Many of the computer models are finally on board with the GFS solution and are showing major snows for the whole Mid-Atlantic and New England region. We are already under a Winter Storm Watch, which was issued by the National Weather Service overnight. In my snow map below, I have put most of the Philaburbia Coverage Area under the 10-14 inch range. If you look at the map, you will see a sharp cutoff in the snow amounts. This is the only thing concerning me right now. If the low pressure doesn’t pick up the trough and ride the jet stream, it will go maybe 100 miles east of the benchmark which would give us much less snow. 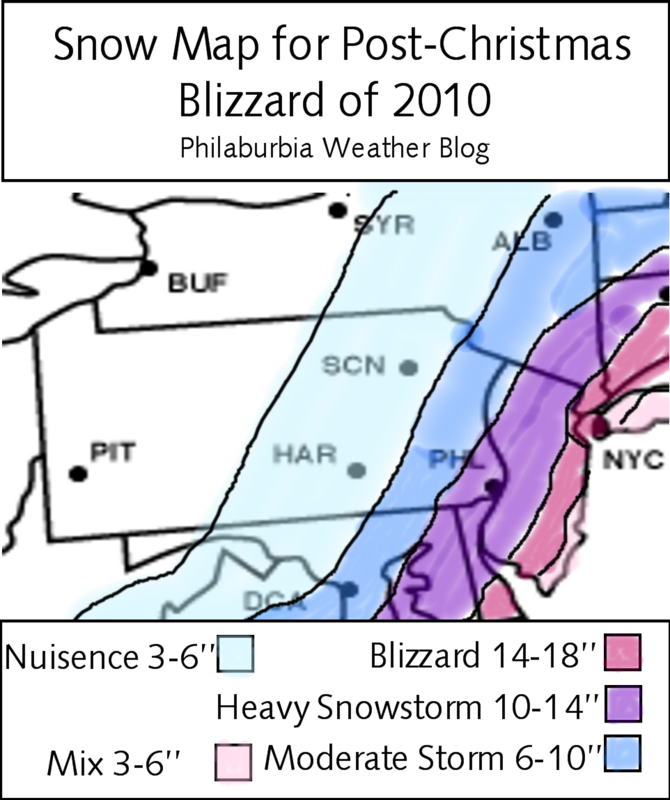 But, as of right now, I am expecting one of the most brutal Nor Easters (competing with last years storms) of all time. Winds will range from 30-50 mph during the height of the storm (Sunday Night). And we will probably see a Winter Storm Warning followed by a shorter range Blizzard Warning during the evening on Sunday. Do not travel on the roads or in the sky from Sunday Afternoon to Monday Evening. Conditions will be on the deadly scale for anyone stranded on a deserted road. I am also concerned for the Eagles–Vikings game tomorrow night. Anyone that is going to that game, be wary that you will be driving in blizzard conditions and sitting outside in blizzard conditions . It’ll be fun to watch on TV, but not as fun for the people going to the game. I will come out with the time frame of this storm as the details become more available. Otherwise, haul your shovels out and prepare for a nasty storm.